Skin-like electronics that stretch and sense will create a way to monitor vital signals and build prosthetics with a sense of touch. Katherine Bourzac is a science journalist based in San Francisco, California. Flexible electronics are enabling prostheses that can feel. Credit: A. Chortos, A. Foudeh & Z. Bao/Stanford Univ. Sitting at her desk at Stanford University in California, chemical engineer Zhenan Bao holds a stretchy sheet of electronics. It is clear, squishy and less than a millimetre thick. When she holds it up to the light, the metallic elements that make up the electronic interconnections become visible. This sheet can do much the same thing as a rigid circuit board, but it wrinkles and gives like skin. “We view the skin as a wearable electronic system,” Bao says. “It has all the components you want to mimic to make better prostheses, wearable sensors and smarter robots.” Unlike conventional electronics, which are rigid and brittle, skin is resilient. It’s stretchy and self-healing. And skin contains a remarkable, integrated network of energy-efficient sensors that pick up pressure, temperature and more. It seems almost a natural leap, then, for researchers such as Bao to suggest using skin-like electronics to give prosthetics a sense of touch. A slew of chemistry and materials-science advances over the past 15 years have enabled researchers to come close to mimicking many of skin’s properties — its ability to self-heal, its stretchiness and its sensing capabilities. Now, scientists need to find ways to pull those advances together in a single design. And they must show that such skin-like devices can do more than single time-point medical measurements, as well as making the artificial skin itself robust enough to wear over long periods of time. 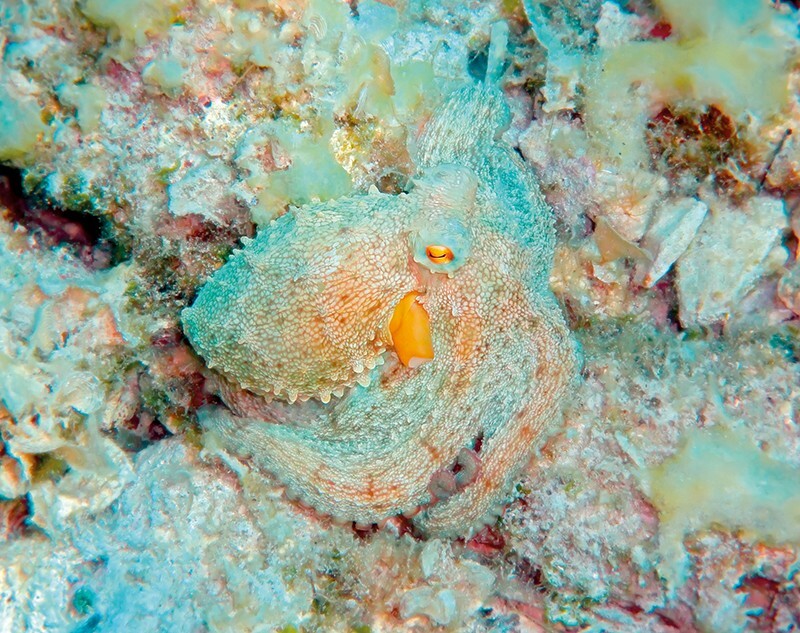 And it is not just human skin providing inspiration, researchers have been trying to mimic how creatures such as octopuses change their appearance (see ‘Underwater inspiration’). Mammalian skin isn’t the only muse for materials scientists. Many are enthralled by cephalopods — the group that includes octopus (pictured), squid and cuttlefish — which can change their appearance in microseconds to match a colour or texture in the environment, or create a disorienting pattern to confuse predators. Octopus-like, colour-changing materials could be used in military camouflage, electronic displays, or even in art and cosmetics. Biologists are working to understand how cephalopod skin works and material scientists are trying to mimic it. The cephalopods’ skin has multiple layers. A white bottom layer provides a reflective background that acts as a blank canvas. Above that is a layer of reflective iridophore cells; some of these can be switched on and off by muscle contractions that hide or reveal their sparkly contents. Next are chromatophores, which expand or contract to reveal patches of coloured pigments. And on the surface layer, octopus and cuttlefish have papillae that pop up to create a rough texture, or go down for a smoother appearance. But despite what they know about how cephalopods control their appearance, scientists are just beginning to understand how the creatures monitor their environment so astutely. The first clues came in 2015, when researchers found4 light-sensing opsin proteins in cephalopod chromatophores, indicating that the animals can ‘see’ with their skin. So far, researchers have only been able to mimic the most basic parts of the cephalopod’s adaptive camouflage. In 2014, scientists layered a sheet of light sensors and one of colour-changing elements, with pixels that alternate between black and white, that could mimic the underlying image5. Such technology could ultimately be used to make adaptive camouflage coatings for vehicles or even clothing. Other researchers are using a similar design — a material that senses the background and matches it — to make cephalopod-inspired thermal camouflage. Early on, researchers working on skin-like electronics focused on robotics applications, says Takao Someya, an electrical engineer at the University of Tokyo. Robots with a sense of touch could perform more-complex tasks and are less likely to break things or hurt someone. But as Someya and his contemporaries worked to give their robots some resemblance of skin, they hit a wall. Flexible electronics have more give than rigid ones, but they still restrict the range of motion when wrapped around finger- or elbow-like robotic joints. “We quickly realized how important it was to introduce mechanical stretch. Without stretchability it’s impossible to apply the electronic skin to moving parts like joints or to curved surfaces,” says Someya, who made the first flexible, large-area pressure sensor in 2003. As those electronics became more stretchable, researchers realized that the materials could be made biocompatible and applied to the skin itself. In 2011, materials scientist John Rogers, now at Northwestern University in Evanston, Illinois, made what he called epidermal electronics1: thin sheets of circuits, the mechanical properties of which were engineered to match those of human skin. Using a suite of mechanical- and materials-engineering techniques, Rogers made rigid silicon — the electronic industry’s material of choice — compatible with flexible and stretchable surfaces. Rogers still uses the same basic set of techniques. Researchers in his lab etch thin silicon components and then use a specially designed stamp to pick them up and transfer them onto rubber-like material. The rigid components sit on ‘islands’ that have been mechanically engineered to protect the silicon from mechanical strain. The silicon electronics — including light-emitting diodes, electrodes and sensors — are connected by spring-like metal wires made using kirigami, a form of origami that uses both cutting and folding. Rogers is now focused on medical applications, including prosthetic limbs. To do this, he’s collaborating with Levi Hargrove, director of the Center for Bionic Medicine at the Shirley Ryan AbilityLab, a rehabilitation research centre and hospital in Chicago, Illinois. The technology has made great strides in the past decade, Hargrove says. Prosthetic arms and hands now exist that have articulated fingers, rotating wrists and elbows. They can lift heavy weights, but they lack the sensors needed to detect, for example, that a cup of coffee is scalding hot, and the nerves to rapidly transmit the corresponding reaction signal back to the hand: put it down! Hargrove and Rogers are collaborating on a system that they hope will enable someone to control a prosthetic hand more like they would a real one. As the wearer imagines moving their wrist or closing and opening a fist, their muscles contract. Some prosthetics (mostly in research labs) use electromyography — electrodes placed on the muscles at the site of the amputation — to pick up on faint electronic traces of contractions. An on-board processor then interprets these electronic signals to control the prosthetic. The approach is promising but awkward, requiring constrictive rubber cuffs to hold 2-millimetre-high electrodes in place over the muscle. The electrodes can irritate the skin and the cuffs can feel uncomfortable and cause people to sweat, degrading the quality of the electrical signal. The accuracy and detail of the electrical readings also need improving. Together, Hargrove and Rogers are aiming to improve both the comfort and accuracy of these systems. Their skin-like electromyography patch is just tens of micrometres thick, lightweight, has holes for sweat to evaporate and doesn’t move around. The researchers have tested it on three people so far. Each epidermal electronic patch is just a few square centimetres and, when placed on the residual limb, allows users to control their robotic, prosthetic hands. 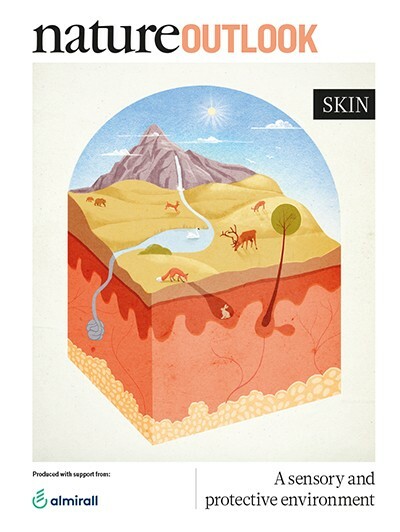 The main challenge that they now have to overcome is the skin itself. “You’re limited by exfoliation,” Rogers says. “The build-up of dead skin cells disrupts adhesion and the facility of electronic measurements.” As a result, the patches themselves only last a week or two, at most. “We’d like to do months,” he says. Every time a patch is replaced, users must readjust: small changes in location means that it picks up signals from a slightly different set of muscles. And each time, the user has to relearn how to control their robotic hand. Rogers would like to collaborate with biologists to solve the problem, and hopes that they could help him to form an enzyme-saturated adhesive to digest the dead cells. These stretchy patches can pick up not just electrical signals but chemical and physical ones, too. Some researchers, including Rogers, are using them to measure metabolites such as lactic acid — a sign of muscle fatigue — or glucose in sweat. Someya is working with dermatologists at the Keio University School of Medicine in Tokyo to develop electronic-skin patches that could assess allergies by measuring rates of evaporation from the skin. Dryness is often a symptom of allergic symptoms. And he’s developing ultra-lightweight sensors that look like a temporary tattoo to monitor blood oxygen and heart rate, along with wearable displays to visualize the data. A flexible circuit designed to capture electrical signals from muscle activity.Credit: J. Rogers/Northwestern Univ. 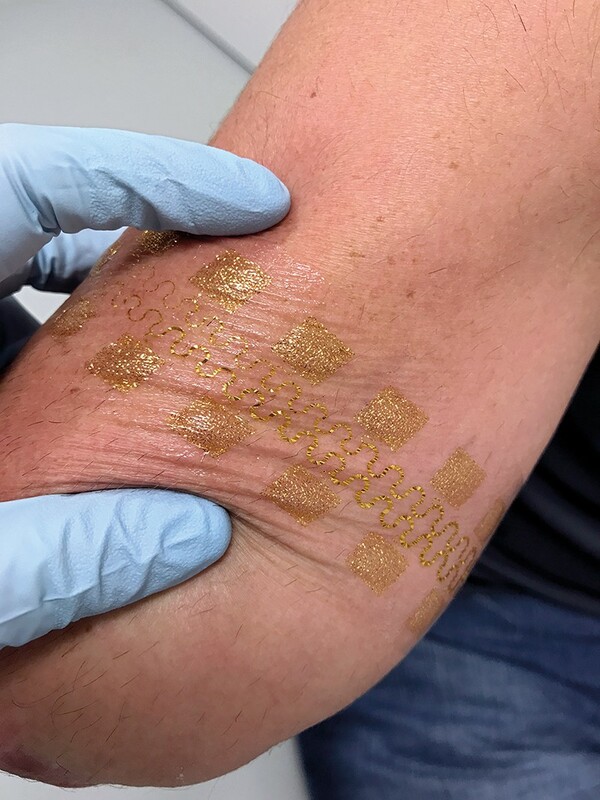 Someya says one of the most promising potential applications of electronic skin is to monitor vital signs and chronic medical conditions over years or months. In tests, the patches take measurements that are at least as accurate as conventional medical equipment, but they are much more comfortable — people can’t even feel them. However, long-term monitoring won’t be possible until researchers can improve the technology’s usability. One approach is to make the sensors disposable, like a sticking plaster. But each time the sensor is reapplied, the data computation has to be recalibrated. So far, most studies have been short, but researchers need long-term data to develop their algorithms — a problem they hope will soon be addressed. Sensors that run continuously, such as those of electronic skin, pose a huge information-processing challenge — whether they’re worn for months or just a day. To handle information as conventional computers do, they would have to send each data point to a central processing unit, an inefficient and battery-draining prospect. To get ahead of this potential data onslaught, Bao is finding inspiration in the way mammals and other animals process information, which is low power and error tolerant. Bao has described2 what she calls an ‘artificial nerve’, one that mimics skin mechanoreceptors, neurons and the synapses that connect them to the spinal cord. This artificial nerve is made from intrinsically stretchy, electrically conductive polymers. The circuits within are also bioinspired. The artificial nerve converts readings from pressure sensors into electrical signals similar to those sent by real nerves. Then, instead of processing every signal individually, these signals are added up by a transistor that mimics the biological synapse. This has two benefits. It could help to ensure biocompatibility. And it results in a system so exquisitely sensitive that it can detect and read something as small as the tiny bumps of braille. Closing the loop between the skin and the nervous system — so that a wearer could both ‘feel’ with a prosthetic limb and control it as naturally as they could a real one — will be challenging, says Dae-Hyeong Kim, a chemical engineer at Seoul National University. Sensing is just one part of such a system. Nerve signals go both ways, to the brain and back again, and when someone can feel what the prosthetic senses, they can also react — both voluntarily and involuntarily. Bao is particularly interested in mimicking natural reflexes. Without thinking about it, for instance, we quickly withdraw our hands from something painful. That’s thanks to sophisticated processing of sensory data: first, so-called afferent nerves transmit information from sensors in our fingertips to the spinal cord. Then, efferent nerves rapidly carry muscle-control signals back to the hand. Bao’s artificial nerves already do something similar, adding up mechanical signals and converting them into an actuating one. Bao’s team even made a crude demonstration of the possibilities by connecting the artificial nerve, which was programmed with a reflex designed to control muscles, to a cockroach’s leg. When the artificial nerve is pressed, the leg twitches as if it has been touched. This work is fairly preliminary, and Bao will need to show that it works in people. She’s hopeful that a future version of this squishy artificial nerve will be biocompatible and could be connected to nerves in a person’s residual limb. “We’ve developed this material with tissue-like softness,” she says, a suppleness designed to ensure comfort. But, Kim notes, researchers still have to work out how to connect “the abiotic part with the biotic part” — the synthetic with the biological — over the long term. Beyond ensuring biocompatibility, designers must also ensure that these systems have a reliable power source, says Xue Feng, director of the Center for Flexible Electronics Technology at Tsinghua University in Beijing. Currently, electronic skins must either be tethered to a power source through a wire — requiring the person or robot to also be tethered — or packaged with a battery. Feng thinks that various energy-harvesting techniques could help. 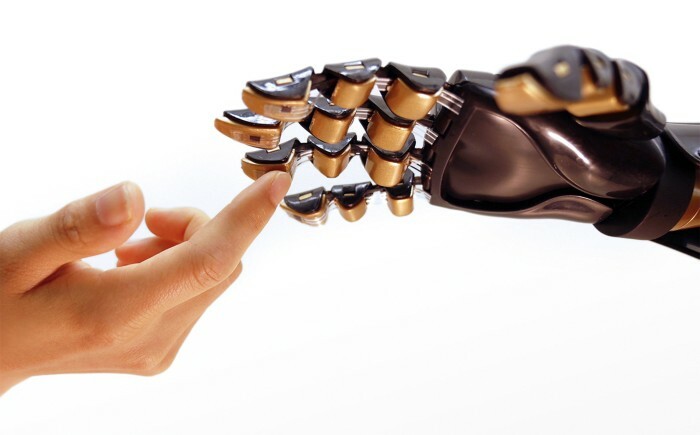 Removing the need for a wire or a battery would mean that artificial skin is feasible for those who have a prosthetic. Feng’s group has experimented with using materials that convert mechanical energy into electrical voltage. This could mean a bend of an elbow or the strike of a footfall is converted into a jolt of power. And Someya’s group has been working on stretchable, skin-like solar cells that, when incorporated into the top layer of an electronic skin, could supply power during the day. Meanwhile, Bao is already working on more bioinspired designs, including electronic materials that have the ability to heal. In August, her group described3 a self-healing electronic system: a wearable heart-rate monitor and simple display. The stretchy system relies on the movement of polymers to ‘heal’ wounds. The conductive polymers flow back together after they’re cut, and could mean that if a future robotic prosthetic gets a cut, it can repair itself. Kim, D.-H. et al. Science 333, 838 (2011). Kim, Y. et al. Science 360, 998–1003 (2018). Son, D. et al. 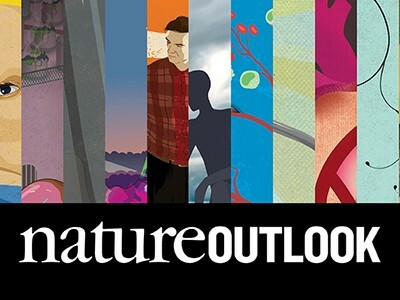 Nature Nanotechnol. 13, 1057–1065 (2018). Kingston, A. C. N. et al. J. Exp. Biol. 218, 1596–1602 (2015). Yu, C. et al. Proc. Natl Acad. Sci. USA 111, 12998–13003 (2014).